Windsor Castle is located in the county of Berkshire, England. It is one of the royal residences and it is the largest inhabited castle in the world. The oldest parts of Windsor Castle were built by the Normans following the victory of William the Conqueror in the Battle of Hasting in 1066. The original castle was made of wood and built in the motte-and-bailey style. 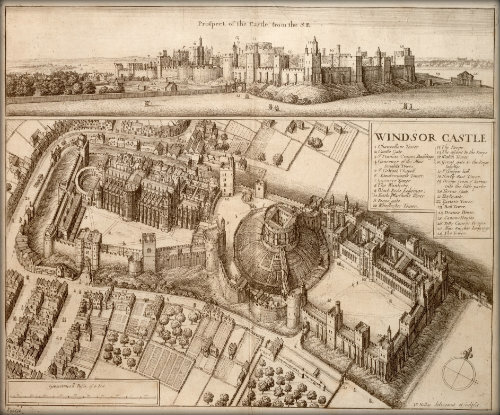 The location of the castle meant that it could watch over the River Thames and Windsor Forest (a royal hunting ground). Henry I was the first monarch to use Windsor Castle as a home and it is during his reign that the wooden keep and walls were replaced with stone. In the 12th century, Henry II upgraded the Windsor Castle walls and added a new stone keep. Edward III was born in Windsor Castle in 1312 and he spent a vast amount of money adding to it and improving it during his reign. Windsor Castle is the headquarters of the Order of the Garter (a fellowship of knights founded by Henry III in 1348). The Tudor monarchs used Windsor Castle. Henry VIII regularly stayed at the castle and he was buried in the Windsor Castle’s Lady Chapel. Elizabeth I spent a great deal of time at Windsor Castle. She liked the fact that it was a safe place that would be able to withstand a siege. Queen Victoria and Prince Albert made Windsor Castle their main place of residence. Following Albert’s death, Queen Victoria was sometimes referred to as the ‘Widow of Windsor’. During World War 2, the windows of Windsor Castle were blacked out, many of the most valuable works of art were moved away, and the royal bedrooms were strengthened in case the castle was bombed during The Blitz. The royal family slept in Windsor Castle during WW2, but this was a secret. The public believed that they were spending the nights in Buckingham Palace. In 1992 a massive fire took place in Windsor Castle. Over 100 rooms were damaged by either fire or the water used to extinguish the fire. The cost of Windsor Castle’s restoration was nearly £40 million. Learn more about castles by visiting our Castle resources page. Helpful for my report on Windsor Castle. Glad we were able to help you out, Lily. No problem! Glad we were able to help you with your homework. thanks these facts really helped on my history project i started last minute. i finished really quick on my last chapter with the facts about Windsor castle. thank you this was really imformative and helped me with my homework. Helped me with my project. This is brilliant about Windsor castle! Great ! Some really interesting facts ready to help me with my year 7 history homework!!! the facts helped me a lot on my research !!!!!!!!!!!!!! !